Whether traversing streets alone, or taking part in tours and visiting historical places, we can learn a fair bit about a new place in a short amount of time. 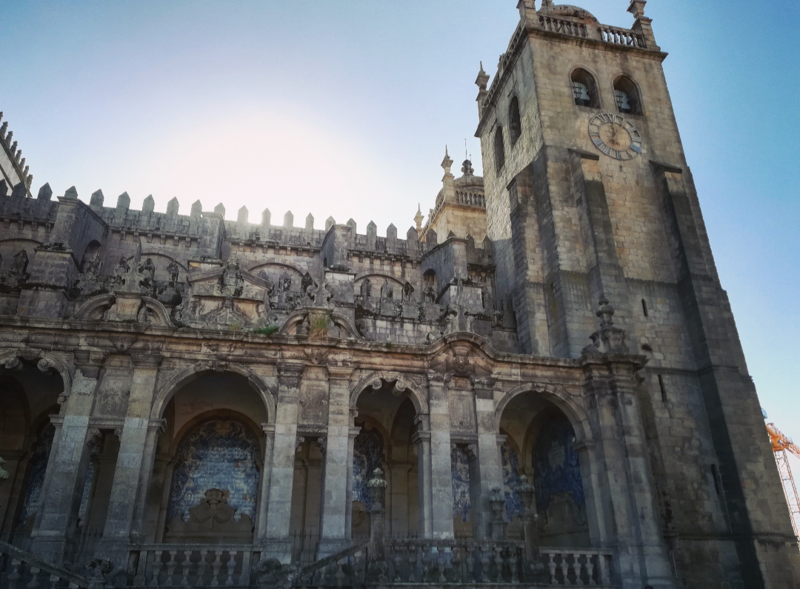 Here are some things spotted and learnt during my time in Porto – or ‘Portus Cale’ as it was once called. Some of this was passed on by an awesome lady called ‘Eugenia’: a middle aged sweetheart with a bubbly personality, infectious laugh and a plethora of tales having lived there for her whole life. Other things have been noticed myself, or learnt through chatting to locals and people in hostels. 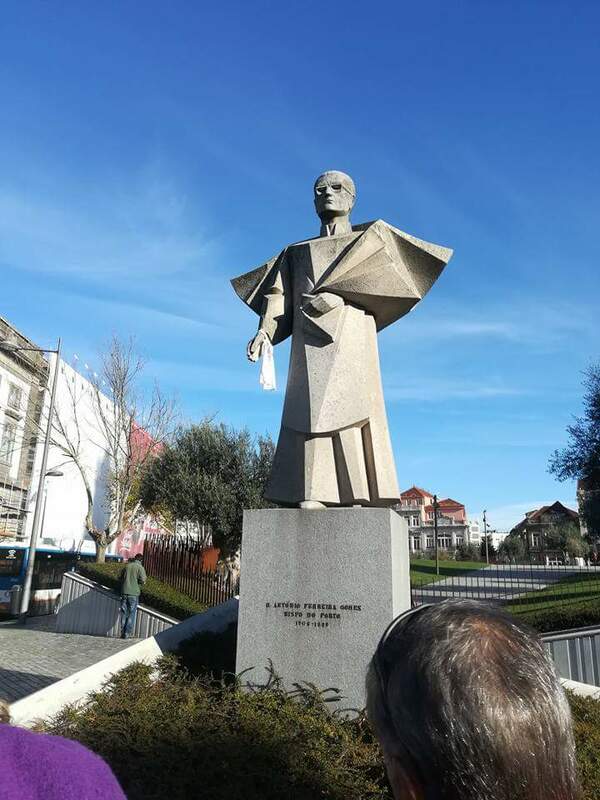 I learnt that Portugese inhabitants experienced the longest running dictatorship (in Europe) under the reign of António de Oliveira Salazar and Marcello Caetano. The dictatorship started in 1926 and ended in 1974. Eugenia faced it herself until she was 9 years old. She told us how she was so confused when she was sent home from school on the 25th of April 1974 and that many thought things were better from the moment the carnation revolution started, compared to Salazar’s suffocating supremacy. Whilst the dictatorship was in full swing, many were too scared to stand up for their rights and the rights of others, or had lost hope. However, one courageous man gave a voice to the previously unheard masses. A man called Antonio Ferreira Gomes, whose statue Eugenia drew our attention to. Gomes, a Portuguese Roman Catholic bishop, did everything in his power to speak up about the injustice people were facing. He supported others, attended trials and wrote a letter to Salazar to explain why he wasn’t his number one fan and wasn’t in favour of his behaviour. It was intended to be private, but you can now read it on the internet. It’s considered one of the most important letters of modern Portuguese history. Secret police stopped him returning to Portugal after a trip to Italy; poor Gomes lived in exile for ten years as a consequence. Referring to the statue once more, Eugenia treated us to her infectious laugh and told how a tourist once said ‘look at his clothes… Is that Elvis?! No, wait – look at his glasses… Is that Elton John?’. Gomes may not be quite as internationally well-known as Elvis and Elton, but he deserves some bloody recognition. What a chap. Despite being greatly traditional, unique Porto features contrasts of old and new, modern and ancient, man-made and traditional, which – for me – is part of its charm. One small example of this is a small shopping centre with a garden beautifully placed on its roof. This garden is home to some lovely old olive trees; perfect to lean on and do some reading. Contrasts are also evident in Porto’s buildings and surroundings. The past, present and future collide and embrace awesomely, beautifully and sometimes shockingly. Back in the day, defense walls (predominantly Roman) circled the city; many of which are visible now (parts, at least). So, in Porto, you may look to your right and see a wall built in the Roman period, and look to your left and see a recent piece of street art. You may look to your right and see a sweet old lady smiling at you, looking like she’s from a portrait from a hundred years ago, hanging out her washing on her balcony, then look to your left and see people on their smartphones. You may go to one part of the city and listen to the incredibly emotional traditional old Fado music, then go to a different bar and see an up-and-coming band. So many contrasts. A holy example of contrasts coming together beautifully is the cathedral. It showcases Roman, Gothic and Baroque features and is just breathtaking. On the street, you will find a huge amount of cranes (looking out from the cathedral’s grounds we could spot 14) and hundreds of chaps on ladders. Some areas of the city are being significantly renovated, yet – at the same time – it somehow manages to preserve its ancient beauty. 3) Who needs Superman when you’ve got Superbok and Somersby? 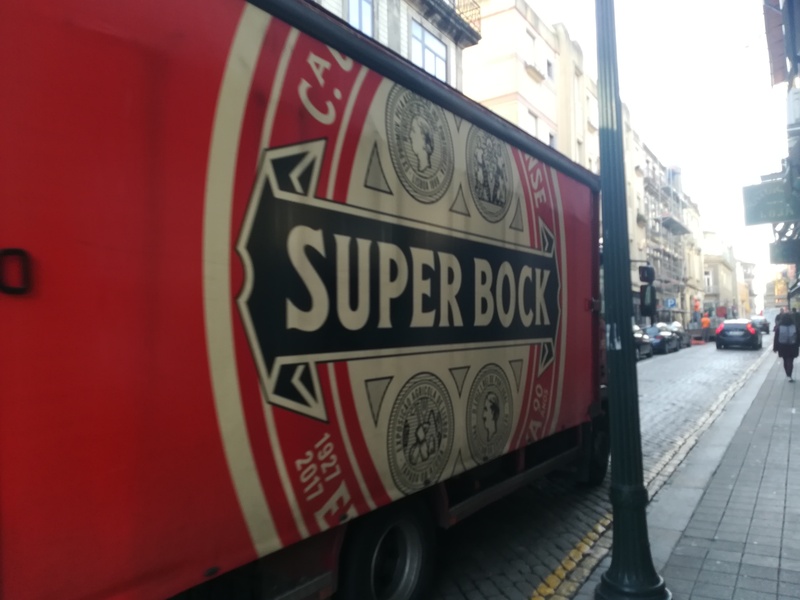 Superbok is the most popular brand of beer in Portugal and it’s eeeeverywhere. It’s been going since 1927 and it’s pretty good, in my opinion. You’ll see it everywhere. 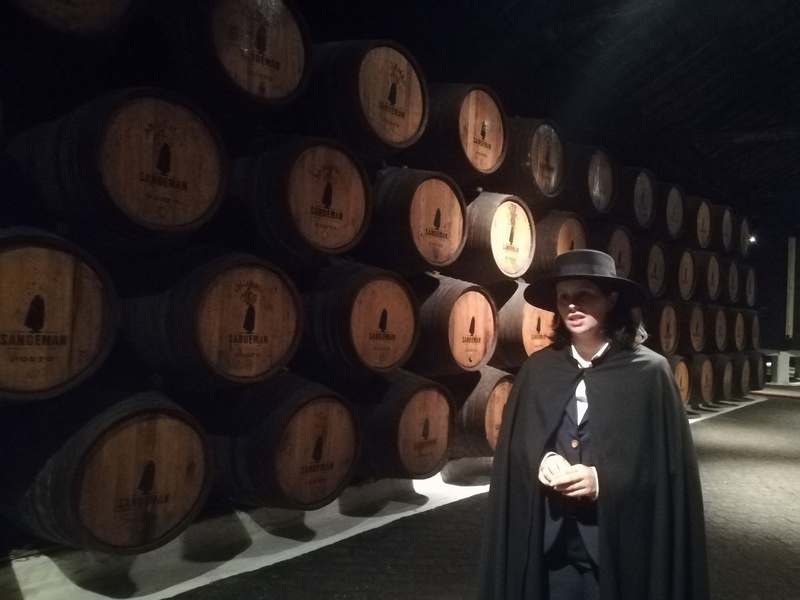 Portugal also has a connection with Somerset – Somersby is surprisingly popular here too! People love tiles here. Why? They are beautiful, provide pretty platforms for artists to showcase their talents (e.g. the train station) and let people brighten up their beloved city. Economically, they are grand too. They are a cheap way of making a place aesthetically pleasing. Practically, they are not bad either. Tiles keep places warm and prevent damp (why d’ya think they are good in bathrooms?). They protect and insulate, display art, conserve and convey cultural loveliness and they are fairly cheap. Makes sense. 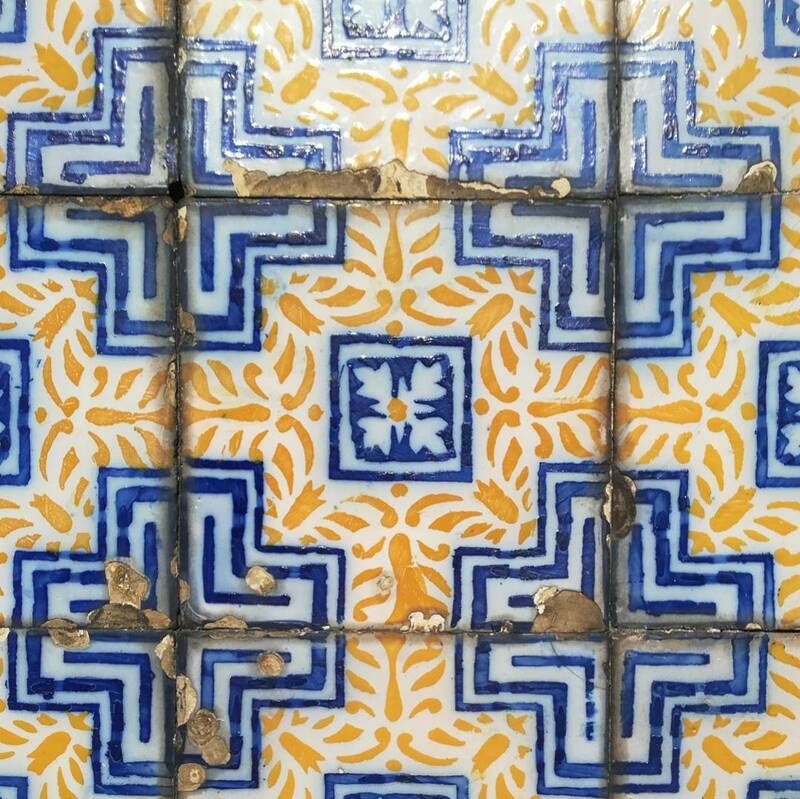 However, the Portuguese cannot claim it all stems from their homeland; such tiles were greatly influenced by Arabians, back in the day. People are generally so bloody kind and friendly. Smiles aplenty. J. K. Rowling lived in Portugal for a portion of her twenties, working as an English teacher (EFL). She met her first husband (who turned out to be an abusive arse) and had a child with him. She had a variety of wonderful and terrible times in Portugal and her time in Porto arguably influenced her Harry Potter books to a great extent. One example is the name of a certain character. Remember the name of the founder of the Slytherin house? Now think about the name of the horrible past dictator of Portugal. Coincidence? Hmm. Links to Hazza Pazza are everywhere in Porto. Walking around, I noticed numerous young adults in long black robes which looked almost identical to the cloaks one would find in Hogwarts. Talking to Eugenia, I learnt that the people I noticed were Porto University students in their 2nd, 3rd and 4th years. 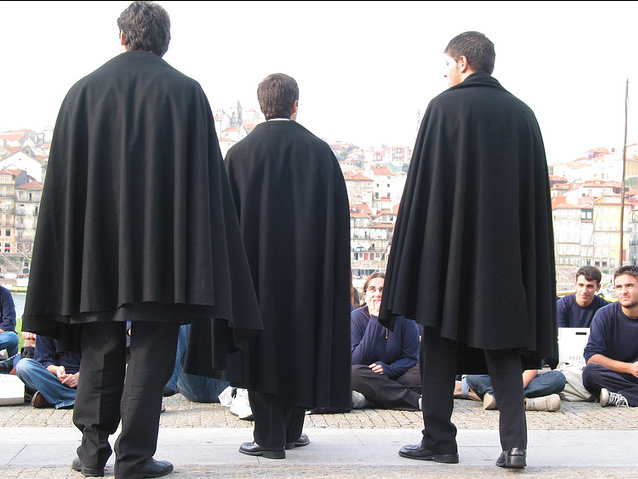 They wear these cloaks during special events and whilst initiating first years! Also, not too dissimilarly from HP, students wear t-shirts of different colours for each departmentment. Whilst walking around the square near the university, I happened to see a load of freshers donning colourful t-shirts, with robed elders standing over them with paddles. The robed rebels haze freshers in a variety of ways, some lighthearted, others dangerous. They are called ‘praxes’ (rituals). Praxes are now a controversial topic for some as there have been some fatalities. People are trying to keep students safe and stop students turning traditional fun into sadistic and dangerous activities. Hazing is an old tradition for first years here. If you don’t take part in the hazing, you don’t get a Hogwartsesque robe later on. Eugenia’s son doesn’t want to take part in the hazing; she was a little bit sad when he said ‘Mum, I’m not going to be Harry Potter’, but relieved that he wasn’t going to take part in potentially dangerous activities. It’s an unmissable place for visitors of the city and its beauty is incomparable. Once inside, you definitely feel its magic and feel like you’re in Hogwarts. 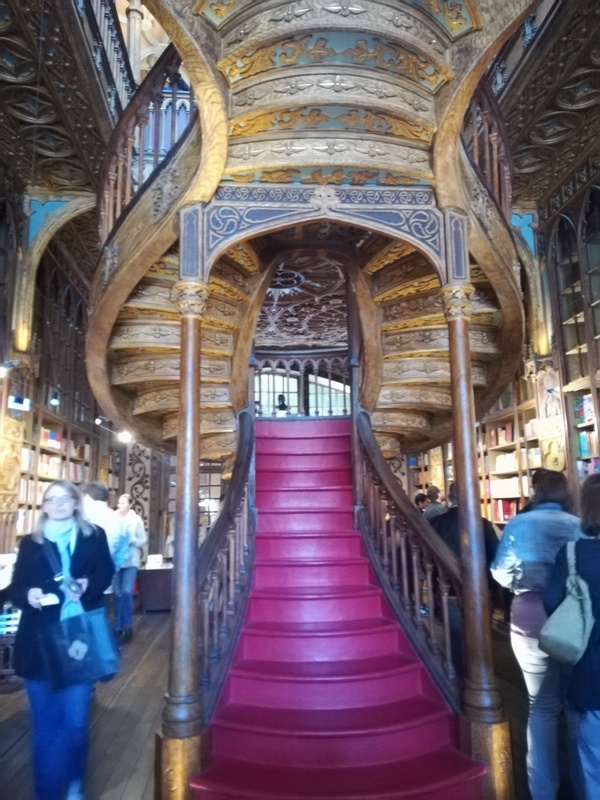 Many say that its windy staircase and general design inspired Rowling. It’s been said that Rowling wrote a significant portion of her work there. I didn’t venture in but some people have told me that it’s amazing, despite being ‘kinda touristy’. The food is awesome. Full stop. Being a veggie, I couldn’t try a lot of it, but what I had was nice. Fish is understandably popular here. Everything from cod cooked in a special way (Bachlaou) to Octopus rice! If it’s fishy, you can find it. Cabbage soup is also popular too. Locals raved about a speciality called ‘Francesina’. It is a a lot of meat and cheese, often cooked in a special fire oven with a load of special sauce (often tomato and beer sauce). It couldn’t convert me, but it’s a meat/cheese/beer lover’s dream! 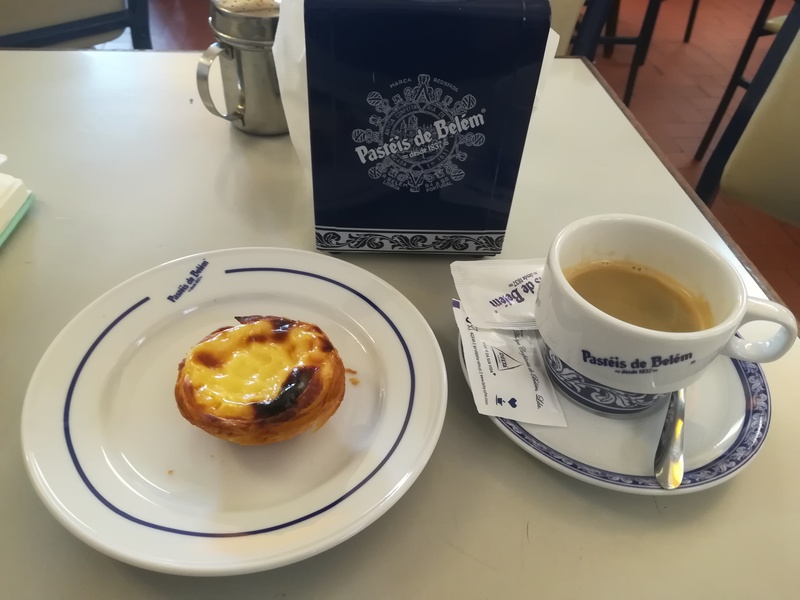 Portugal is also home to ‘Pasteis de Belem’ – little cream cakes! It was founded in Belem, Lisbon in the 1800s and is still popular today. Check the lovely original cafe of the same name in Lisbon, if you can. It is still going strong and is a wonderful little place. Nobody makes them like they do there. They have kept their secret recipe from the 17th century. If you are not into dairy, they have other options too. Chances are, you’re guessing that Porto is the birthplace of Port…. Riiiii-wrong! Ironically, it’s actually Gaia – a town on the other side of the river of Porto – just over the bridge. If it’s your cup of tea, I recommend visiting a wine cave or wine cellar and having a little tour (and taste). I went to the Sandemans one and thoroughly recommend it. Porto isn’t just a friendly place; it is pretty environmentally friendly too! It won an award for its CO2 emission mission with corks in bottles. (Portugal is famous for cork in general). Additionally, many (if not all) of Porto’s buses run on natural energy! Football is huge here. Hugeeee. It brings the community together. When they win big games, citizens take to the squares and streets and have huge parties. Harrison Ford was even spotted at one. 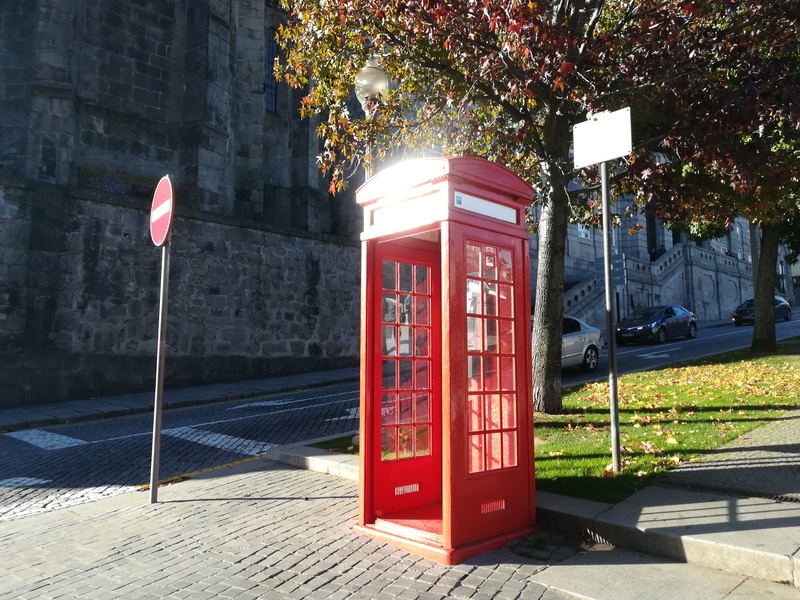 Brits, if you’re meandering around Porto and keep seeing red telephone boxes, don’t worry – you’re not missing Britain so much you’re hallucinating! For some reason, there are loads of them around Porto. 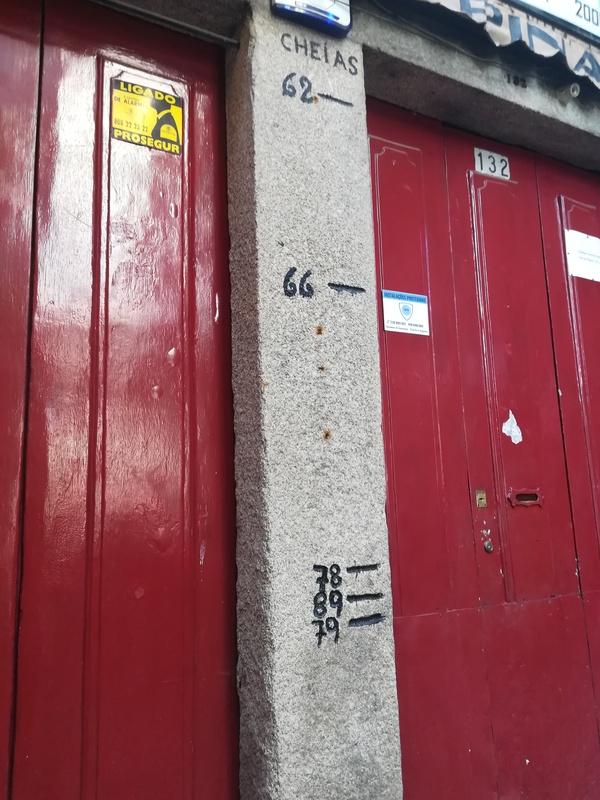 Porto and Gaia have faced a fair few floods in their time. Whether roaming around or visiting wine cellars, and you’ll find a load of signs of flooding and dated marks. The most well-known type of music in this region is definitely ‘Fado’. Fado music is no fad! It is deeply rooted in Portuguese culture and beautifully woven into its character. Fado music is played with a guitar and intended to make listeners feel extremely emotional. It is popular in many parts of Portugal, particularly Lisbon, Coimbra and Porto. 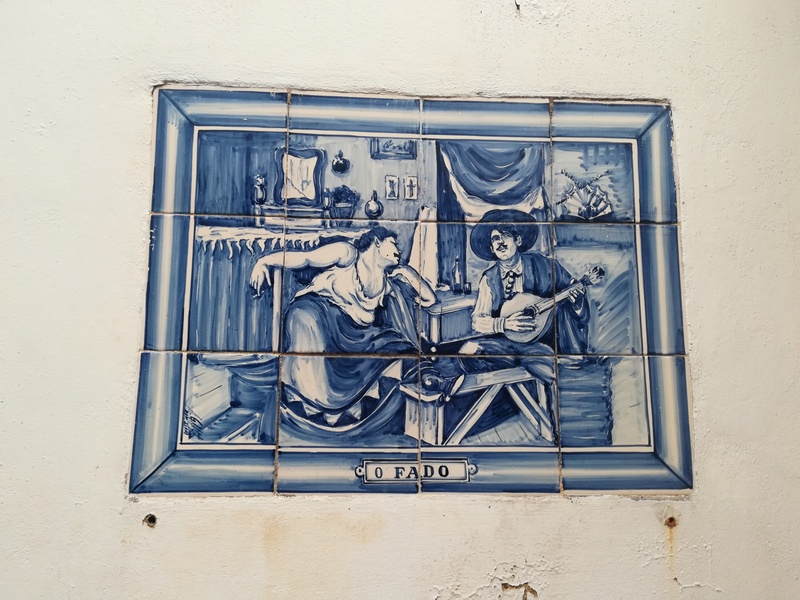 Fado started in the early 1800s and remains popular to this day. I love it. JK Rowlings lived in Porto for about 10 years and I’m definitely sure she got her ideas from the bookstore and the students wearing black. Her visuals were definitely influenced by the beauty of Porto and surrounding areas. Thanks for stopping by and liking Perambulating Porto. Hi Karina. Thank you for your lovely message and the confirmation/extra info. What’s the most interesting thing about Porto in your opinion? Do you live there? It was a pleasure. I am very fond of Porto. Likewise – thanks for stopping by my blog! There were too many interesting things in Porto to pick one thing. No, I don’t live there. I just had a wonderful vacation there in Oct.